When it came time for us to harvest our rhubarb for the first time, I turned to you all on Facebook for ideas. The response was amazing, a lot of great ideas came through. We’ve been busy with them too. So far we’ve made pie, which was quite great. And we I say we I made Hubby and I. He made the pie, and the jelly, but I made the crisp. This rhubarb crisp has become a favorite to make considering how easy it is to make similar to have how easy it is to make our simple mini donuts. Now, before we get started, I had to use my small slow cooker, as I was already using my large one for supper. Summer is the season of slow cookers here. Heck, even the slow cooker is too hot sometimes. Mix together the cut rhubarb, fresh or frozen, we used frozen, with the white sugar, little bit of flour, and cinnamon. Dump it in your slow cooker. 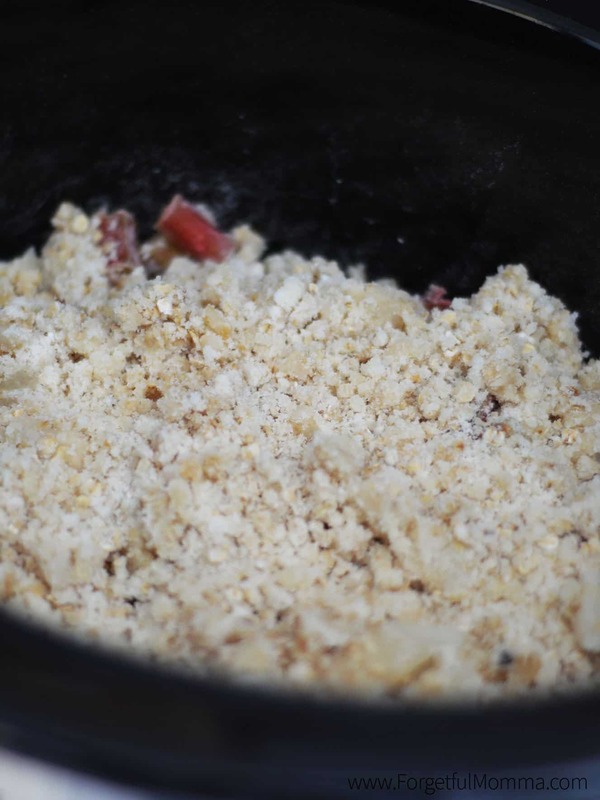 Mix together the remaining, creating the crumble. 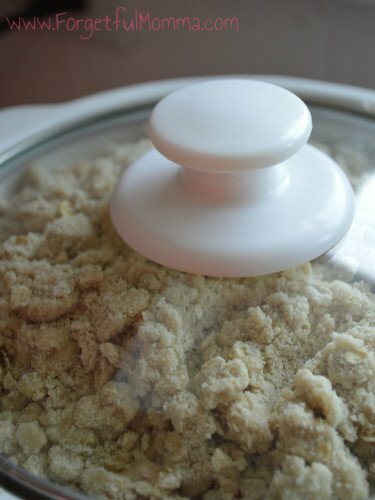 Spread the crumble over the top, place lid and cook on low for 3 hours. It was so full I questioned if I was going to be able to fit the lid on top correctly or if it was just going to sit on the topping. It did fit! Now you can see just how full my is here. If you are using a small (2.5 qt) you’ll need to cook it an hour longer. 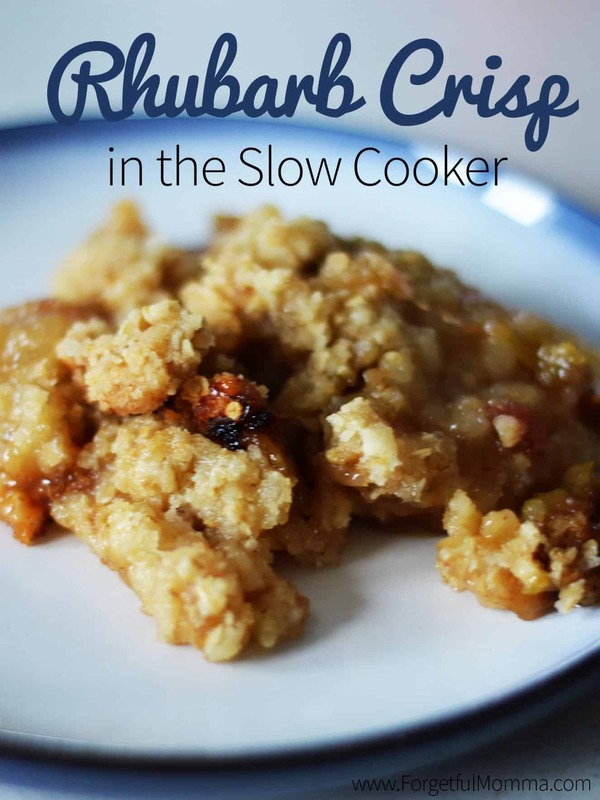 If your are using a larger, casserole sized one then the 3 hours on low will do the job… this isn’t the only rhubarb crisp we’re had recently. Once it cooked, and cooled enough to enjoy it, it was amazing! I may or may not have eaten most of both crisps that I have made. I have a really bad sweet tooth. Have you tried making anything with rhubarb before? 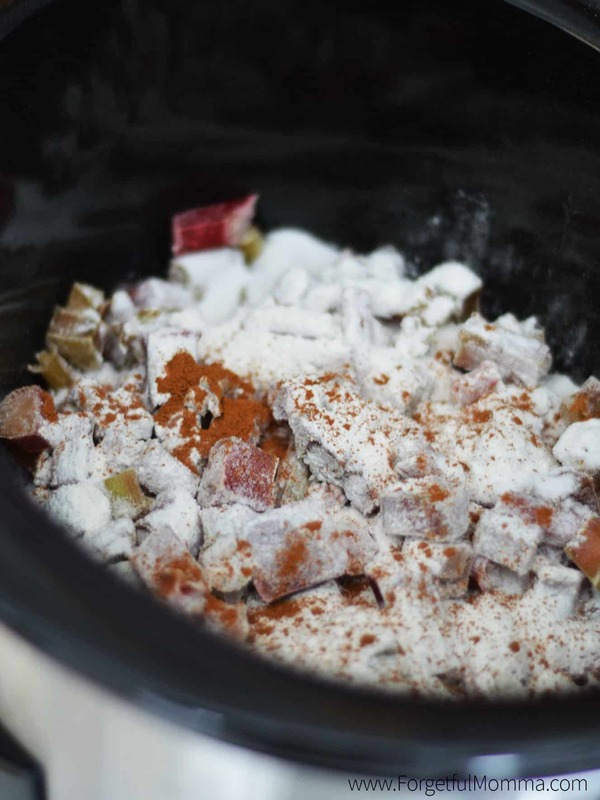 Combine rhubarb, sugar, flour and cinnamon and put into your slow cooker. 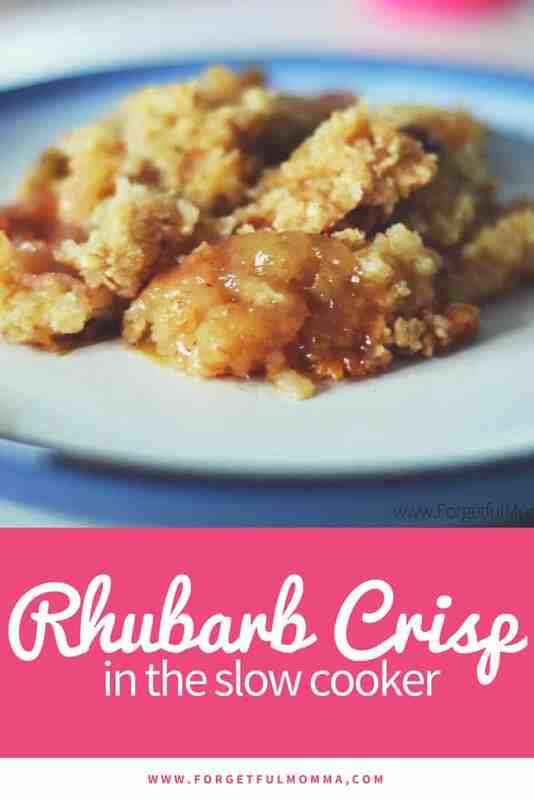 Combine flour, brown sugar, rolled oats and melted butter and sprinkle topping over rhubarb mixture. 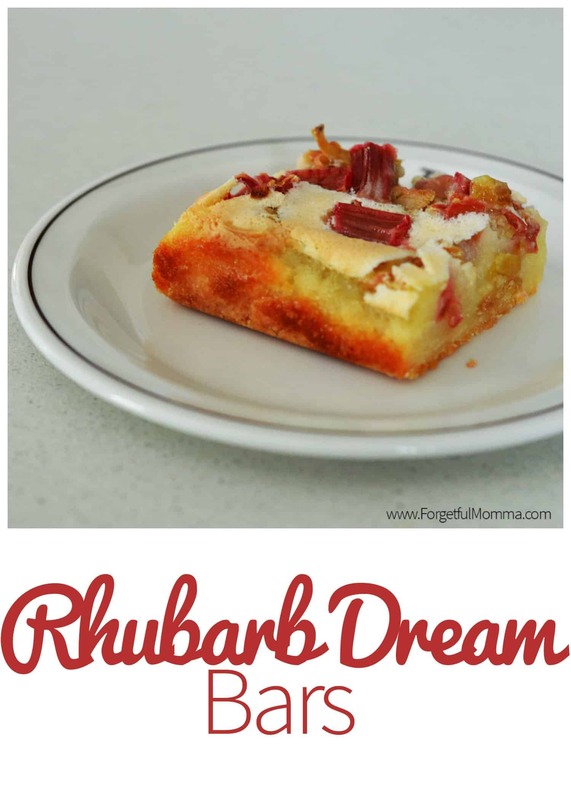 I love rhubarb and this sounds like a nice idea to do something different with it. This looks so delicious! I absolutely love rhubarb! Thank you for sharing this at the #SmallVictoriesSundayLinkup! This is a little embarrassing, but I have never cooked with rhubarb before. 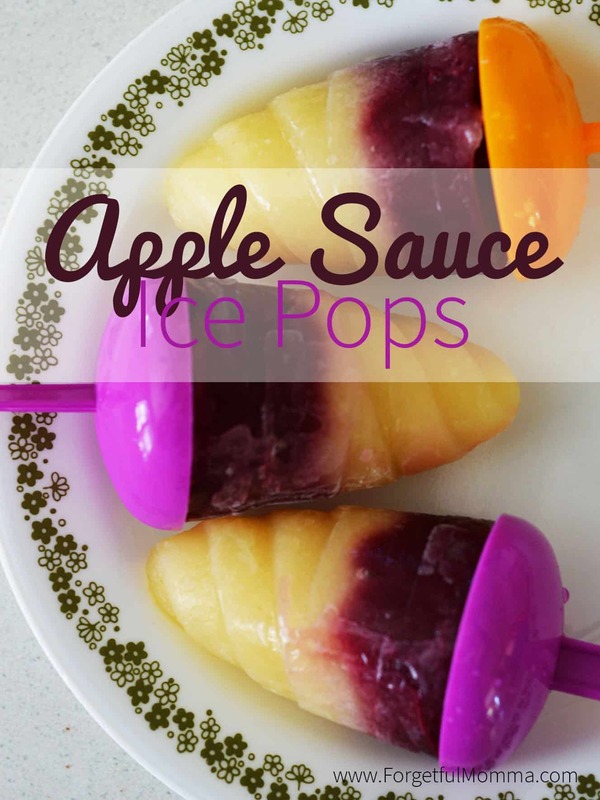 This looks like an easy and delicious way to use it! Thanks for sharing with us at Dream. Create. Inspire. Link. Hope to see you again this week! Looks easy. Having cook-out Memorial wk-end and it’s hot here in Illinois already! 90’s for our area so I’m looking forward to this one! Thanks! Whenever I hear rhubarb, it takes me back to my youth. We had rhubarb in our back yard. 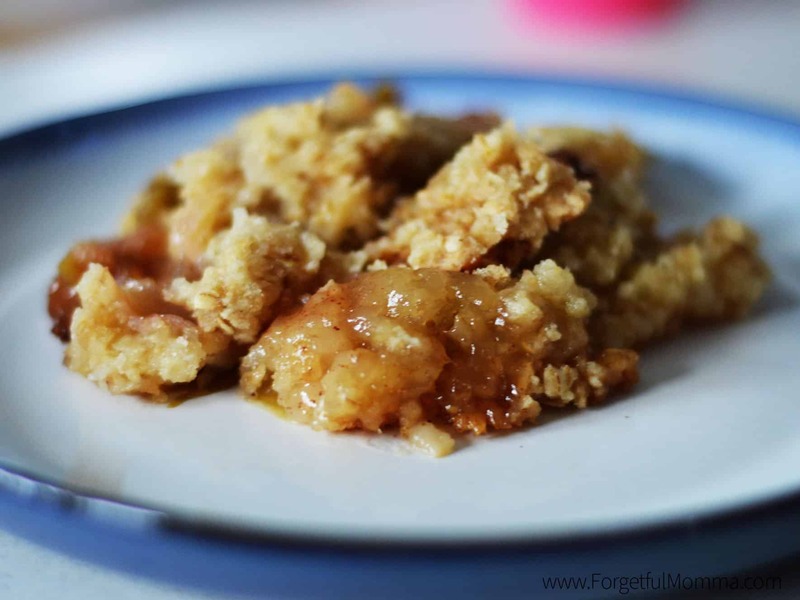 The only thing that I ever remember having with rhubarb in it was cobbler, The rhubarb crisp sounds delicious, and I love using my slow cooker. I am actually going “home” to my brother’s (he now lives on my childhood farm) tomorrow. I will have to see if he still has some of that rhubarb there in the back yard. Thank you for sharing on Sugar and Spice.